Yesterday I got the best birthday present a lifelong Trekkie could hope for: Star Trek is coming back to television -- kinda, sorta. It's been over a decade since Star Trek ended TV production and, while fans have had two successful films to enjoy (or despise), corporate infighting between CBS and Viacom has kept the franchise from its rightful home on the small screen. However, it looks like the two companies have hugged it out with the news that a new Star Trek series will return to "television" in early 2017. And while this would normally be cause for celebration among Trekkies, the announcement doesn't come without a few caveats in terms of who's making it and how it's being distributed: The show will be produced by the team in charge of the recent films, and it will only be available via CBS' subscription streaming service, CBS All Access. It's a bit of a no-win situation (a Kobayashi Maru scenario, if you will) for die-hard fans who wanted to see Star Trek back on television. Star Trek may be back, but it comes at a cost: both figurative and literal. When Star Trek: Enterprise went off the air in 2005, few fans were sorry to see it go. The franchise had declined in quality and edgier fare like the Battlestar Galactica reboot had wormed its way into the hearts of sci-fi geeks. But maybe absence does make the heart grow fonder, for many die-hard Trek fans were thrilled when J.J. Abrams' Star Trek film made its way to theaters in 2009. Granted, Star Trek hasn't always had the best track record when it comes to film, but after four years of nothing, any Trek was welcome Trek. As a life-long Star Trek fan, I had plenty of reasons to be optimistic about the Abrams film. I was a fan of Alias and Lost -- both of which he'd executive produced. The cast was appealing and the fact that the screenwriters made the reboot work within established continuity tickled my geeky heart. The film got lots of people excited about Star Trek again -- including my non-Trekkie boyfriend. Thanks to local TV reruns and Netflix, he caught up on the original series through Deep Space Nine (Voyager's been... slow going, to say the least). The problem with watching so much classic Trek with him is I realize how much new Trek pales in comparison. Star Trek is generally a slow-paced, intellectual humanist brand, something that has never translated well to the big screen. Old Trek makes me think; it's even made me cry. And so I've turned against new Trek, with its whiz-bang action aesthetic. Its continued presence in the cultural landscape has kept the franchise off TV where it works best. The situation wasn't helped by all the infighting between CBS and Viacom, with the former continuing to churn out old Trek merchandise and stream the old shows, while the latter wanted to wipe the slate clean in favor of the Abrams version. CBS has made it clear that this new Star Trek will only be available on its streaming service, CBS All Access. But now, with yesterday's announcement, it looks like things have been sorted out on the corporate side in favor of Viacom and Abrams's production company Bad Robot. 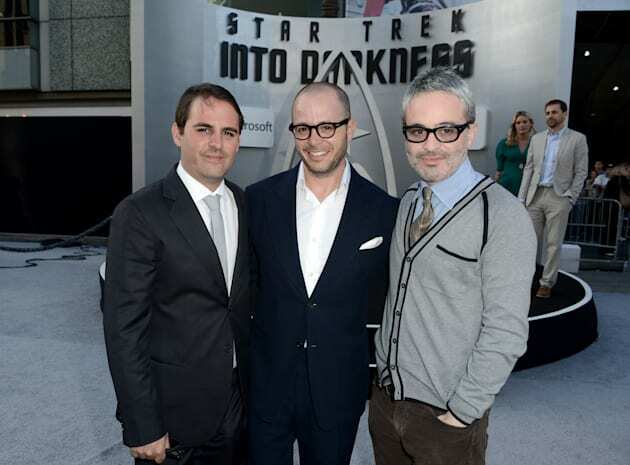 The new show is being executive produced by Alex Kurtzman, who co-wrote both new Star Trek films. I hated the Abrams-directed Into Darkness with all of the power of a matter-antimatter explosion, so I'm only sort of getting what I wanted in this new show. It's like if I asked for a Wii U for Christmas and found something that looked like one under the tree, but actually played PlayStation 4 games. Sure, the PlayStation 4 has a lot of great games and maybe I'll enjoy them, but I really wanted to play Splatoon. I said I wanted a new Star Trek show, but what I meant was something that embodied the old spirit while taking advantage of the slower pacing of television. Thing is, we don't actually know what this new show is about. We know it will "introduce new characters seeking imaginative new worlds and new civilizations, while exploring the dramatic contemporary themes that have been a signature of the franchise since its inception in 1966." But that's really it -- the show doesn't even have a showrunner yet. It might not even have a concept beyond the franchise name. How willing are you to add another streaming service to your repertoire? What it does have, though, is a distribution plan. Because while Kurtzman is still looking for a head writer, CBS has made it clear that this new Star Trek series will only be available on its streaming service, CBS All Access. Sure, you'll get a brief taste of the show on CBS proper, but that's just to wet your whistle enough to pay $6 a month to watch the rest of it. CBS has always had a rather hesitant relationship with current on-demand and streaming services -- while you can watch pretty much the entire Star Trek catalog on Netflix and Hulu, popular programs like The Big Bang Theory continue to be MIA everywhere but CBS' own website. So it really wasn't much of a surprise when the network unveiled its own proprietary streaming service. Plenty of networks are embracing the idea of their own apps and sites -- even CBS' sibling channel, Showtime, has a service you get by itself for $11 a month, or even as an add-on to PS Vue or Hulu (but bizarrely enough, Showtime Anytime is not included in CBS' All Access service or vice versa). How willing are you to add another streaming service to your repertoire? Content is king, and this new Star Trek series is the first exclusive show announced for CBS All Access since the service's launch in late 2014 -- and it won't debut until 2017. In the meantime, you have Netflix, Hulu, Amazon, HBO Now and a host of other services all hammering at your wallet. We may have been begging for "à la carte" programming, but that future is here and the cost is creeping steadily upward. The four services I just mentioned will run you around $40 a month combined, and that doesn't include other types of programming, like sports (MLB.tv is $25 monthly, for example). We're at a point where getting your content from just one or two services isn't possible. Sure, we all know that you need Netflix for House of Cards and Amazon if you want to watch Transparent, and we're fine with that because they're big services with a lot of mainstream programming. But the more diverse and esoteric you get, the harder it is to find everything you want. I'm a big anime fan, and while I can easily watch Kill la Kill on Netflix and Tiger and Bunny on Hulu, I'm not so lucky when it comes to more recent shows like Wakakozake, which is only available on Crunchyroll. As content gets spread out further and further, out-of-pocket cost increases (on top of what I pay for Netflix and Hulu monthly, Crunchyroll costs me $7, and if I wanted to watch anything on FUNimation's service, it could cost me $5). With more media companies going the All Access route, we may eventually be looking at a set of bills that rivals the cost of cable, which hit an all-time-high nationwide average cost of $99 back in September. Will any of us watch this new show? In the meantime, plenty of people have cut the cord, and it looks like "America's Most Watched Network" has finally started to take action. CBS skews older and Star Trek is turning 50, but that property still stretches across demographics. I love Star Trek, and my parents (who watch a lot of CBS) are the ones who got me into it in the first place. The thing is, will any of us watch this new show? My parents certainly won't -- their access to streaming services comes through shared passwords because they're still wedded to the old broadcast/cable model. And my desire to pony up for CBS All Access hasn't increased one whit since the announcement Monday morning due to my dislike of new Trek and unwillingness to subscribe to more services. The suits at CBS might be counting on brand loyalty from old-school Star Trek fans to drive All Access subscriptions, but they're asking them to pay for something that doesn't look or function very much like the Star Trek they know and love. No sign yet that the company will actually fix the underlying design flaws. Fans are free to battle it out for chicken dinners once again. Four laptops will ship with NVIDIA’s latest GPUs and 9th-gen Intel. That's 21,000 options to read. You don't have to visit your local courier to send an order back.